Who starts the discussion? Who is supposed to keep it going? How do we meet everyone's standards for good work? Who is in charge of keeping track of what everyone has done and of the stuff we're supposed to do? Sometimes, it is a good idea to pick formal roles and to give them to the students; at others, it is best to give students a list of suggested roles and let them sort out their group's internal dynamics themselves. One thing you will want to do is make sure that the roles rotate among the group members. You might want to randomly assign the roles to group members or randomly determine an order for students to pick their role for the activity. This kind of randomization will help avoid rigid group structures and expectation effects. It also allows different individuals to develop and utilize different competencies. Random procedures also combat potential prejudices associated with roles - for example, teachers want to avoid allowing males to serve as leaders, while females serve as the "secretaries." Finally, random procedures also create a non-threatening means for students to share personal information and to develop closer relationships. Appropriate roles will depend on group size and the nature of the cooperative learning task. The lists of roles described below are intended to be representative but not exhaustive. Leader/Editor: This student is in charge of organizing the final product of the project, be it a paper, a presentation, etc. That doesn't mean technical details, but of making sure that the project meets the standards set out by the instructor (often as a rubric), plus any extras stipulated by the group. These standards generally include punctuality and completeness. Spokesperson/Press Secretary/Webmaster: This person would be responsible for the technical details of the final product and would be ready to summarize the group's progress and findings to the instructor and to other groups. Facilitator/Encourager: This student gets discussion moving and keeps it moving, often by asking the other group members questions, sometimes about what they've just been saying. Timekeeper: Someone needs to make sure that the group stays on track and gets through a reasonable amount of material in the given time period. Summarizer: Every so often (perhaps once per question for a list of questions, or at the end for one question), this student provides a summary of the discussion for other students to approve or amend. Reflector: This student will listen to what others say and explain it back in his or her own words, asking the original speaker if the interpretation is correct. Elaborator: This person seeks connections between the current discussion and past topics or overall course themes. 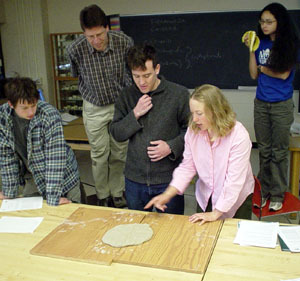 Doing CL (Collaborative Learning): Group Roles (more info) : suggested roles and an example of how roles are used in one particular cooperative-learning class.